Non-publication of clinical trial results has been recognized as a serious scientific and ethical problem. Underreporting frustrates evaluation of a drug’s utility and safety, and fails to redeem the sacrifice of trial participants. Thus far, policy measures to counteract non-publication have focused on trials of interventions used in practice. However, 9/10 interventions entering clinical testing never achieve marketing licensure. What happens to the results of those trials? Figure depicting the rates of publication of trials of licensed drugs compared with trials of stalled drugs–overall and by major subgroup. In our most recent publication, my colleagues and I systematically quantified the proportion of trials of unlicensed interventions that are not published. We used clinicaltrials.gov trial registration records to create a sample of clinical trials of drugs that achieved licensure between 2005 and 2009 (“licensed drugs” or “translated drugs”) and drugs that stalled in clinical development (“stalled drugs”) in the same time period. Our sample included registered phase II, III or IV trials that closed between January 1st, 2006 and December 31st, 2008 and tested a drug in the treatment of cancer, cardiovascular disease or neurological disorders. We felt this sample provided a relevant and contemporary look into a wide swathe of drug development activity. We then searched Google Scholar, PubMed and Embase, and contacted investigators to determine the publication status of each trial in our sample at least 5 years after reported primary endpoint collection. Whereas 75% (72/96) of registered trials of licensed drugs were published, only 37% (30/81) trials of stalled drugs were published. 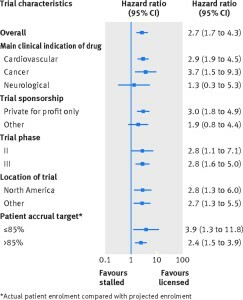 The adjusted hazard ratio for publication was 2.7 (95% confidence interval 1.7 to 4.3) in favour of licensed drug trials–that is, clinical trials of licensed drugs were almost three times as likely to publish findings as trials of stalled drugs. 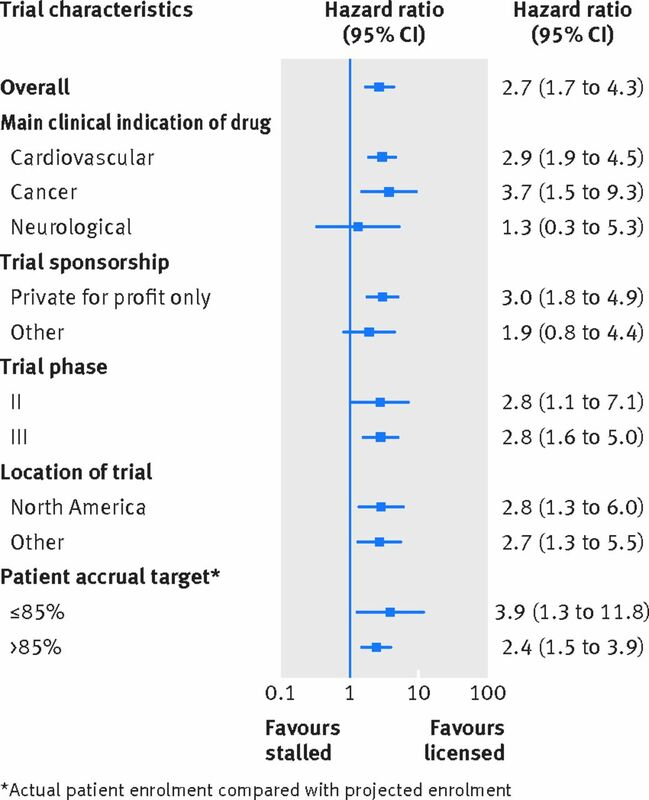 Higher publication rates for licensed drug trials were observed regardless of disease type, sponsorship (industry involvement versus not), trial phase, and location across the globe. Figure depicting the proportion of trials of licensed and unlicensed interventions that are published as a function of time from reported primary endpoint collection. 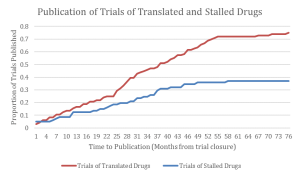 The publication of stalled drug trials plateaus over time around 37%, whereas the publication of translated drug trials attains 75% in the same time period. Moreover, a total of 20,135 patients participated in trials of stalled drugs that were never published. 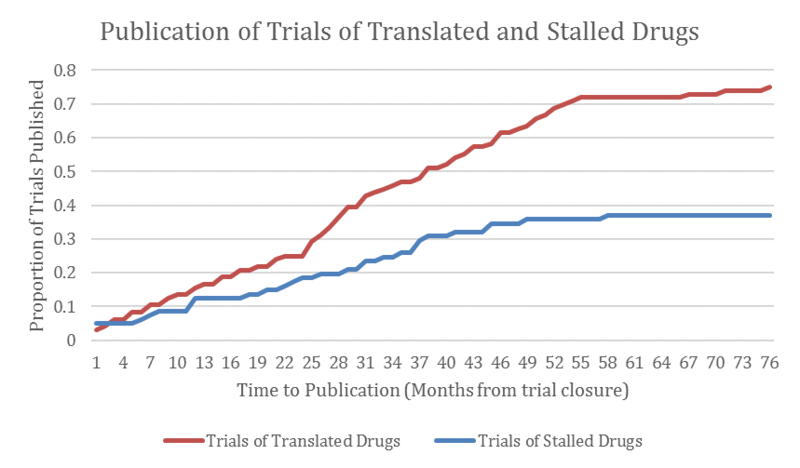 In addition to the alarming implications for these patients, trials in unsuccessful translation trajectories contain a wealth of scientific information for research planning, such as validation of pathophysiological theories driving drug development, as well as data about drug safety and pharmacology. All of this information vanishes when trials of unsuccessful interventions are not published. 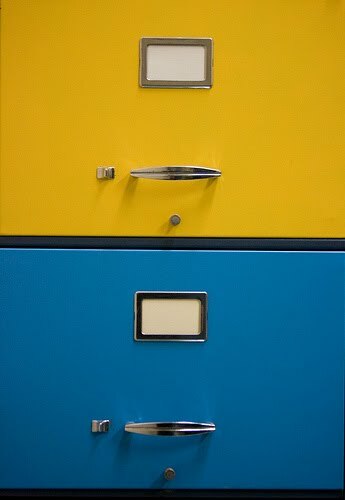 Our key finding is that much of the information collected in unsuccessful drug trials is inaccessible to the broader research and practice communities. Our results provide an evidence base and rationale for policy reforms aimed at promoting transparency, ethics, and accountability in clinical research. One such potential reform is the Notice of Proposed Rulemaking entitled “Clinical Trials Registration and Results Submission” issued by the US Department of Health and Human Services in November 2014. The proposal, which moves to implement the FDAAA summary results reporting requirements for trials of licensed drugs and to extend them to trials of unlicensed drugs, was closed to public comments on March 23rd, 2015. The rule is now undergoing revision. Much has already been said about Filing Cabinet syndrome in medical research: the tendency of researchers to publish exciting results from clinical trials, and to stash null or negative findings safely away from public view in a filing cabinet. Nonpublication distorts the medical literature, because it prevents medical practitioners from accessing negative information about drugs. Recall that, back in 2004, attorney-general Eliot Spitzer sued Glaxo Smithkline for suppressing trial results that showed elevated risk of suicide for adolescents taking the antidepressant drug Paxil; this and several similar episodes led FDA, major medical journals, World Health Organization, World Medical Association, and others to require researchers to register clinical trials before they enroll any patients.